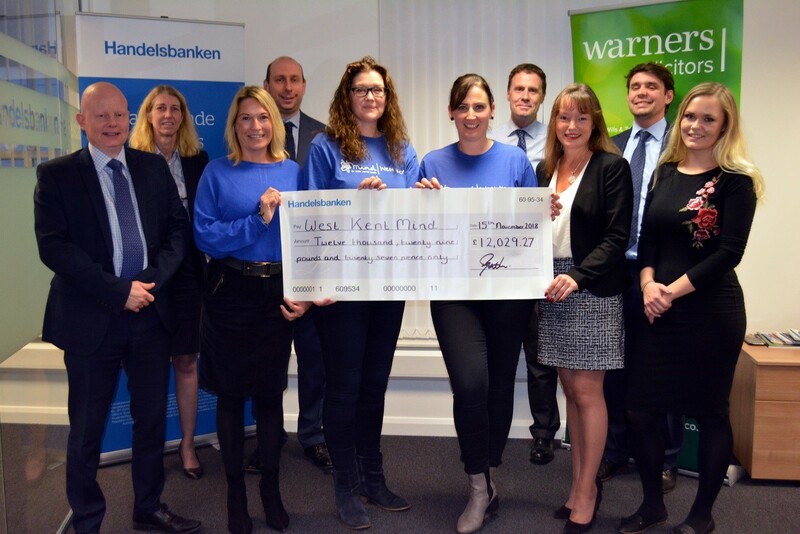 Two Sevenoaks based firms, Warners Solicitors and Handelsbanken, have raised over £12,000 for West Kent Mind, smashing their original target of £10,000. The team of ten walkers and two support drivers took on the notorious ‘National 3 Peaks Challenge’ earlier in the year. Tackling the three highest peaks of Scotland (Ben Nevis), England (Scafell Pike) and Wales (Snowdon) the team walked a total distance of 23 miles (37km) and a total ascent of 3064 metres (10,052ft), a significant proportion of which was undertaken during the hours of darkness. This was an incredibly demanding challenge, which took a huge amount of preparation. The team undertook one training walk each month. The training programme started with an eight mile walk on the Ashdown Forest and ended with a challenging 26 mile hike on the South Downs. Team member Chris Jeffrey, from Handelsbanken, said: “This was a really daunting challenge. The team was a real mixed bag of ability with some members being very experienced hikers and some being complete novices. It took a lot of motivation and discipline to make it to the end. We were all so thrilled when we made it to the final summit of Snowdon and only had the final descent to go.” Chris added “We are very grateful to Sevenoaks Prep School for supporting West Kent Mind by generously allowing us to use their school minibus for the event”.